Enter a realm of magic with Wizard Shop slot to get your potions for everything including having tons of fun and claiming fabulous winnings. Wizard Shop slot game lets you bring some playful magic to your world as you find your potion in the old man’s other-worldly laboratory. Expect to play wizardry-linked attributes on the dense set of reels of this fun slot game with plenty of features to draw in the magic and give you plenty of opportunity to claim tasty winnings. With 6 rows rather than the conventional 3, this slot reels set up is rather dense and accounts for the many paylines. As you can imagine, this magical and playful slot has a lot of wizardly icons appearing on its reels. Expect images of different magic potions, book of spells, rune stones and the Wizard himself to show up. Other attributes referring to a different place and time appearing on the reels are images of an hour glass, parchment rolls and the Wizard’s magic chest. The image of the Wizard himself is the highest paying symbol and also functions as a special Wild symbol. The slot game has some engaging features. One of these are the Wizard coins. These can appear randomly on the reels for you to collect. You can win extra coins with help of the Scatter symbol and your coins can be exchanged for other features like Added Wilds, Wizard Wild Multipliers and other rewards. Wizard Shop has two different Wild symbols. Not only do they pay out on their own from two-of a kind, they also substitute other symbols in different modes of the game. The image of the Wizard is the Wizard Wild Multiplier and can substitute any other symbol with exception of the scrolls and the Wizard’s chest. When an entire reel consists of Wizard images, the Wizard Wild Feature is triggered. During this feature all other Wizard images turn into Wild symbols with the aim of forming as many winning combinations as possible. The Wizard Wild has a Multiplier attached to it that increases any winnings made during the Wizard Wild Feature up to factor 10. The magical-blue Wild Symbol has the same function as the Wizard Wild with the difference that it only appears during Free Spins when you have applied at least one Added Wild upgrade. Both the image of the scrolls as well as the icon of the Wizard’s chest can function as the Scatter symbol. Three Scroll-Scatter symbols appearing on reels 1, 3 and 5 in one spin triggers the Wizard Shop feature, where you are awarded 120 coins, which you can exchange for extra Wild Symbols, Multipliers and other rewards. Once you are in Wizard Shop feature mode you can activate the Free Spins round that awards you 10 Free Spins. Before the start of Free Spins mode you can exchange collected coins to upgrade the Scatter symbol, that during Free Spins takes the form of the Wizard’s chest. When you choose to upgrade the Scatter symbol your bet and any winnings derived from ot during Free Spins will be multiplied up to factor 5, depending on the Scatter upgrade you have chosen. 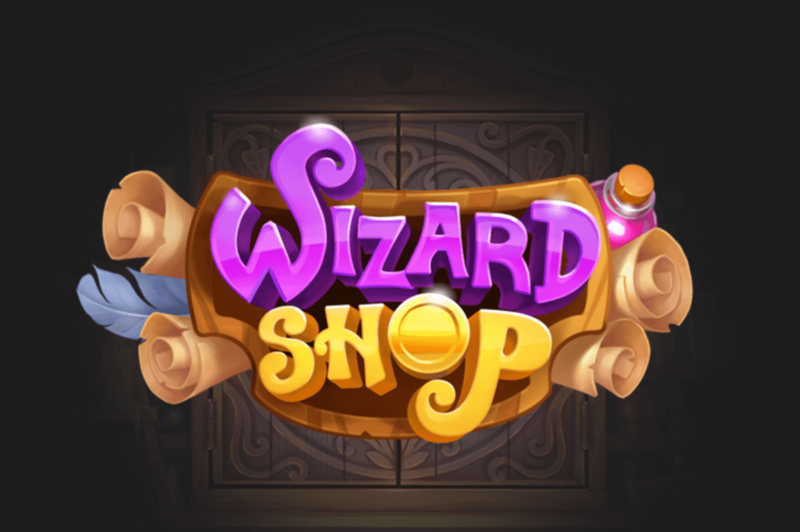 As Wizard Shop slot game is very accessible and has a medium volatility rate, it is likely to appeal to a wide variety of players. The highest paying symbols including the image of the Wizard don’t pay out as much in case of 5-of-a kind. However, the Stacked Wild, Multiplier and coin collecting features attached to some images can not only activate additional features but increase the changes of winning considerably and multiply any winnings you make. The theme of magic always seems to stir gamblers’ imagination and much of Wizard Shop’s magic is likely to rub off in the form of decent slot game entertainment and winnings.